Welcome to our class page! We hope you enjoy looking through photographs of some of the fun activities that we have enjoyed this term. You can also find a list of Spellings and our current Topic Web below. This is us carrying out our Big Science Event experiments in the sunshine! 14.3.19 The importance of clean hands. Today Laila brought in an amazing device that her mum borrowed from the hospital where she works. Everyone applied the 'Glow Cream' to their hands and were then instructed to wash them thoroughly. They then placed their 'clean' hands under the special light which illuminated any germs or bacteria that were still present. The children were amazed to observe that although their palms were relatively clean, the fronts of their hands, fingers and fingernails showed otherwise. A lengthy discussion followed on how long it takes to get hands really clean and whether we can ever wash off all germs. We had a great time celebrating World Book Day. When the children returned to school from swimming they were eager to get changed into their outfits. It was touching to see how they supported each other, particularly with the application of whiskers, noses, hair gel and hair dye. The result was a motley crew of assorted characters who enjoyed being in role for the rest of the day. Thank you for your hard work in the costume department which enabled all the class to feel involved. 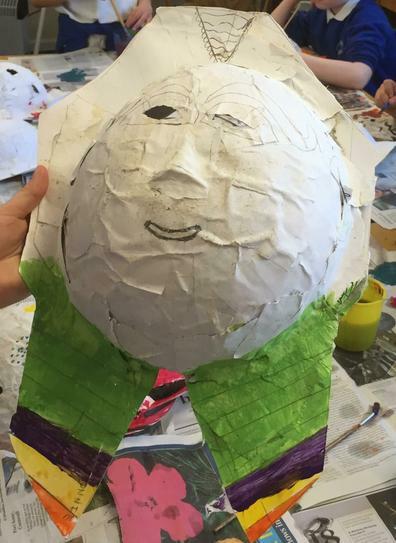 Term 4 is already starting get very busy and we are only one week in! Boreal Owls have been learning all about the production they will be performing in with Snowy Owls and we have already distributed the main speaking parts, although every part is important to the success of the play. We have even learnt one song in an afternoon. Swimming continues on a Thursday morning and German lessons will be taking place on Thursday afternoons. Homework will be given out on Fridays as usual and will consist of spellings to be learnt, a maths consolidation exercise and/or a writing/topic task. The children are expected to read for pleasure each evening and have their books signed by an adult. Times tables practise is ongoing. Our topic web outlines the curriculum areas we hope to cover this term-as our performance rehearsals intensify slight adaptions may have to be made. Our Egyptian death masks are nearing completion! 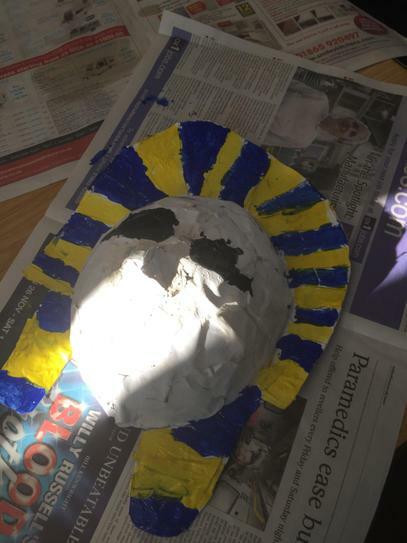 February 2019 -Egyptians have been the theme in writing, art and craft this term. After being shown pictures of the Egyptian Eye of Horus the children used their own individual artistic flair to develop exciting designs using wax pastels. 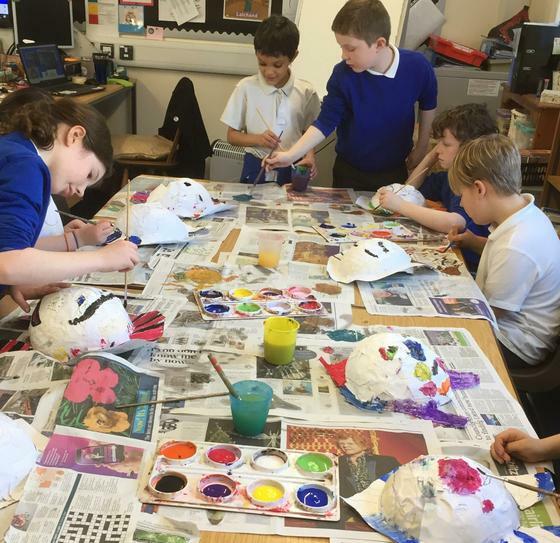 Wednesday and Fridays have been a paper-mache days; designing, creating and now painting Egyptian Death Masks. They will look stunning when they are finished. The children have planned and written some well thought out time slip stories and are showing greater skill at editing and proofreading. Their descriptive language has been a thrill to read. Over the holiday we hope your child will be able to spend time developing their entries for BBC 500 Words competition and, of course, reading as much as possible to increase their vocabulary and exposure to a variety of story genres. Enjoy the break together and thank you for your continued support. In Science we had lots of fun recreating our digestive systems and seeing how they work using a plastic bag, an old pair of tights, some biscuits and a banana!